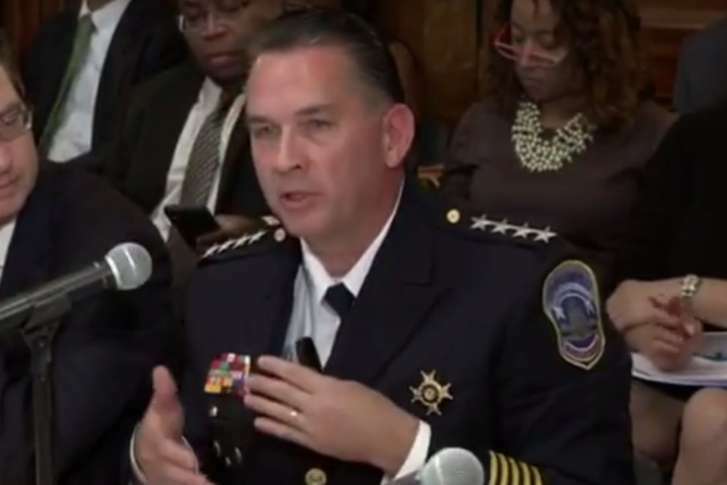 D.C.’s police chief on Thursday offered a council committee explanations for the rise in the murder rate at a time when the District’s violent crime overall is down. He followed, and addressed, hours of residents’ complaints about use of force and a lack of transparency in the department. WASHINGTON — For roughly five hours on Thursday, a D.C. Council committee heard complaints, allegations and anecdotes from city residents unhappy with the police department, ranging from leadership to the rank and file on the streets. Their common thread was doubt about how committed the department is to transparency, especially after several recently implemented initiatives. Before the hearing in the Wilson Building, Michael G. Tobin, the director of the Office of Police Complaints, said that for the second year in a row the number of complaints filed against officers was at a record level. Most of the officers, however, were exonerated, he said. There was also an increase in the number of incidents where an officer used force, though there’s been a drastic reduction in the number of times officers discharged their service weapons. Much of the hearing focused on the department’s relationship with city residents, both at the macro and micro level. “A strong relationship between the community and police is absolutely essential to success,” said Newsham, who called it his top priority since taking over the department. But those who testified before the council said the police still had a long way to go. “The community doesn’t trust the police when they frisk 11-year-olds and then refuse to answer questions about it,” Denise Krepp, a commissioner in ANC 6B10, told WTOP. She said the department initially tried to charge her $5,000 last December so she could compare police body-cam video taken by the police at an incident in her Hill East neighborhood with cellphone video taken by residents. When she asked for a waiver as an ANC commissioner, she says she was told she could not see the video. Activists who testified accused the department’s leaders of trying to cover up misconduct. “We get approached by police officers all the time, especially black police officers, who tell us about the retaliation that they face in trying to report these things,” April Goggans, a core organizer of Black Lives Matter DC, said before the hearing. At times the testimony got incendiary, and both Newsham and Sgt. Steven Bigelow, who leads the DC Fraternal Order of Police, were interrupted during their testimony. But Ward 7 Councilmember Vince Gray said the image of the department that police leaders were portraying in the hearing just doesn’t match what too many people in some of the city’s neighborhoods experience. But he also argued that many allegations of misconduct or illegal actions, including ones that go viral, tend to be rooted in falsehoods. “We’ve got to be honest when we discuss these issues, and talk about exactly what happened,” countered Newsham.